This is one of the most asked questions being a Hosting Provider – what is my email configuration settings and where can I find it? The best place to find this is in the Welcome email you received when you setup your new Hosting account. Login to your control panel > http://yourdomainname.co.za:2083 or http://yourdomainname.co.za/cpanel – replace “yourdomainname.co.za with your actual domain. 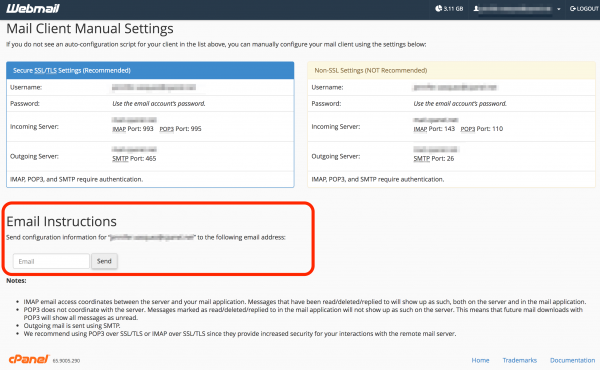 Using that little box inside your webmail interface you can send yourself instructions for configuring any cPanel-hosted email account. The real excitement starts when you notice that the email containing instructions also has a mobile configuration file attached to it. Open that mobile config file on your mobile device and 95% of the work is done for you already. All you have to do is confirm the settings and enter your password. The account is set up for you! Whohoooo!! !